They dont teach anti judaism they teach Catholicism. I went to their Churches for years and the only "anti jew" thing I heard was prayers for jewish conversion which is not anti jewish but rather the most charitable thing a Christian can do. These guys need to get their yalmakas out of a twist. I hope the SSPX sticks to teaching real Catholicism. I think they're more concerned about the Bishop who denies the Holocaust. I listened to a couple of that guy's online speeches. They will make your skin crawl. He should be censured by the Church until he stops his anti-semitism. Well, I would say "denies" might be a tad too strong a word. "I believe that the historical evidence is strongly against, is hugely against six million Jews having been deliberately gassed in gas chambers as a deliberate policy of Adolf Hitler...I think that 200,000 to 300,000 Jews perished in Nazi concentration camps, but none of them in gas chambers." Dumb statement, and insensitive, no doubt, and he was punished for it by the Society. There are bishops out there promoting heresy with impunity. Perhaps Rome can work on that scandal more rather than fuss over this silly bishop. I highly doubt he will go along if the SSPX takes the deal the Holy See just offered them last week. Firstly, the ADL is bunch of whiners who will accuse everything under the sun of being "anti-Semitic". This is another organization whose criticism I would take as a compliment. Secondly, imagine if the prayers said something truly anti-Semitic. If they specifically prayed for the Jews not to convert to Catholicism, then the ADL would complain on the basis that such exclusion is anti-Semitic. Either way, they are going to criticize you. Finally, the idea that Holocaust "denial" is inherently anti-Semitic, is one of the dumbest ideas I know of. Trying to explain the logic behind it, is like trying to explain how 2 +2 = 5. The fact that people are waking up to the truth (and not buying the crap that the media feeds them) behind this absurd horror story has nothing to do with anti-Semitism. Sometimes people end up being right for the worst of all possible reasons. Only if you so desire. I am simply sick of the lack of logic applied to such matters. It's bad enough that groups like the ADL push this agenda, but even worse that people buy into it without the slightest bit of critical thinking. A Jewish friend of mine once told me that a quarter of the world was Jewish before the Holocaust. I think that Abraham's seed has now touched all men - all of us are Jews, truly. All of us have been united to the House of Israel and the Son of Man who was God in the flesh. But the idea that several hundred million died in the Holocaust? I think my friend did not understand the whole situation. But I've always heard 4 million as the number, more or less. Anything else is inconsistent with the vast majority of the testimony I've heard. And where did you hear this testimony? all of us are Jews, truly. I guess some folks here are referring to the fact that Jews have intermarried so extensively that most of us wear Jewish jeans. Yes, their genes are everywhere. For example, my husband has duputrens contracture which is apparently of Jewish origin, but is found extensively in Scandanavian countries. Well if Jordache is Jewish, then I guess they're right! Methinks that might be a spurious connection. So the idea is that Jews, who make up a very small percentage of the world's population, many of whom have not and do not intermarry, have somehow bred with everyone? And truly one of the tightest inbred of folks, the Ashkenazi, who are some of the biggest users of genetic counseling? I doubt it. The weird thing about the Ashkenazi ain't their insistence on intermarriage or "converting" to marry, but their incredible success at doing so. The whole calculus of "suffering" and evil is sorta sick from the ground up. Are 4 million better than 6? I dunno. Seems wrong. I ain't no utilitarian or at least try to avoid the Anglo-American pull in that direction. For historians and the like, these are issues to be sorted out and there should be no magic 6 million number. And I don't see how this gives or robs Jews of "genocide cred". They like many others were systematically sought out, deprived of property, family, basic humane treatment, and then life on an enormous scale. This cannot be denied. If that number is 3,642,431, so be it. No Jew or weird holocaust nerd fetishist should care. May their memory rest eternal. I saw how being one of the few survivors in my family weighed on my Grandfather his entire life. Not dying was no walk in the park either for many. 1. What evidence do we have even for the 4 million number? What if we find out that the number is really more like 1 million? 2. What of the countless Catholics, Poles, and Gypsies who were interned in the concentration camps? Why is this portrayed as just a Jewish thing? I thought Stewart had already settled the calculus of suffering debate...? Jews (of which I am one) portray this as "a Jewish thing" (without, btw, minimizing for one second the horrific murder of countless Catholics, Poles, Gypsies, etc--many at the hand of Stalin and not a few at the hands of so-called "Christians") because there was a public and concerted effort on the part of the Nazis to completely eliminate the Jewish "race", amongst other so-called "undesirables". Ever been to the Holocaust Museum in D.C. or Yad Vashem in Jerusalem? So, perhaps I *am* mistaken, after all. In answer to your question, "What if we find out the number is really more like 1 million? ", let me respond in true stereotypical Jewish fashion with a question of my own--Why are there so many people who seem to like to reduce or minimize the number of Jews murdered? And, would it make it somehow less significant or horrific if the number was 1 million? Would that act as some kind of salve to someone's conscience? A bishop who asks questions of the official history we've received regarding the Holocaust I would think is hardly anywhere near as much of a threat as a bishop who preaches that Christ didn't rise from the dead. Even if it were "more like" one million, it would still have been one million too many. How can we possibly try to quantify human suffering? It is a venture which is fundamentally de-humanizing. However, an insensitive Bishop as well as an outright heretical one will both be a stumbling block to many. The ADL is a piece of crap. The V2 RCC has changed their teaching in regard to Judaism. There was nothing wrong with their original teaching. Ecumenism is dumb! Teach the truth, stop changing things because it upsets people. If someone denied anything else (genocide commited against Armenians, or what people did to Native Americans, Aboriginals of Australia, etc.) people wouldn't care. Hell, what if I denied that the Irish were persecuted by the Brits...no one would make as big of a deal. Why? The ADL is a tad racist itself. I just think it's fishy how they put the holocaust in the spot light more than anything else. I'm not a holocaust denier, although I think the numbers are out of whack, but that doesn't mean we should call for the heads of people who have reason to not accept the exact story the winners of the war make. Bigotry to you all who attack someone so harshly over that. It's insensitive to question the established history? That's not the point of my first question, though. If the original numbers were wrong, how do we know we can trust the current numbers? Is there such a bishop? I hope not. I'm just using a hypothetical comparison to make a rhetorical point. That may not have been the point, but that's kind of how it came across. As for whether or not the original numbers are right or wrong, see my post above. The Nazis, were, as you know, scrupulous, almost obsessive record keepers. And, even if your point about trusting past numbers to be able to trust "the current numbers" (not sure what you're referring to here, but never mind), was clear, to participate in this kind of counting, is, as Cavaradossi wrote, very much fundamentally de-humanizing. What happened to those 2.5 million deaths? Why has this number not been subtracted from 6 million figure? Of course not. It is wise to question history as the "Powers That Be" continually attempt to recreate history in their own liking. However, a bishop who fails to watch his tongue can pose problem to everyone around him. If that bishop could introduce PROOF to substantiate his claims, that would be another matter. I have heard that he claims that few actually died in gas chambers, but that most who died under Hitler, including millions of Christians, died of starvation, disease, being crushed in cattle cars, and other forms of execution, such as the firing squad. So, what do you think of this statement from Bp. Williamson? He doesn't deny that Jews died in the concentration camps, which itself is an atrocity. All he denies is that they were executed by the millions in the gas chambers. Good catch! 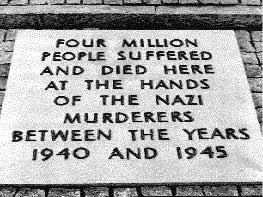 Hoettl himself says that 2 million were killed "in other ways..." and I can't see that he said that 4 million were gassed. Bp. Williamson just could be correct in his statement, as far as the numbers are concerned. The fact remains, however, that approx. 6 million Jews were murdered, and that it was a deliberate policy of Adolf Hitler to rid Europe, if not the entire planet, of all Jews. You know, "The Final Solution". Sounds pretty deliberate to me. Just for a little perspective...as we discuss how many millions of people were murdered in various ghastly ways, please let us not forget that every single one of those millions was a human being, created by the very God you and I worship in His own image, and beloved and precious to Him, if not to those who committed the atrocities, supported those who did, turned a blind eye, and those who deny it ever happened. Just shooting people proved expensive and cumbersome so they eventually switched to assembly line type extermination camps. They were actually developing ammunition shortages.